I had my first watermelon of the summer just this past weekend, with fall quickly approaching and end-of-summer panic starting to set in. Either I'd forgotten how good watermelon is or I ended up with a particularly tasty one, because it was pretty delicious. After sharing it with friends at a Labor Day barbecue, I ended up with about half a large watermelon left over. Which was fine with me, because what I'd really wanted it for in the first place was making cocktails. I'd been reading about recipes for watermelon cocktails for a little while, and suspected that they might work better than cantaloupe cocktails (which were OK, but nothing I'd try making again). At the top of my list was a recipe from Saveur for the Red Lady, which involves pisco—a liquor I have a particular fondness for—as well as cayenne syrup, lemon juice, and basil. Then there was the In-Sandiary, a tequila-based cocktail with ancho chile, which I would have made for the name alone (sandia means watermelon in Spanish), and the Kentucky Devil, with bourbon, adobo sauce, and edible gold flakes (which were optional; I opted out). For the Red Lady, I muddled basil and watermelon in a cocktail shaker, added the pisco, cayenne syrup (I actually made the syrup with aji merquen, a Chilean spice blend that's predominantly crushed smoked chiles, instead of cayenne), lemon juice, and ice, and shook it up before straining the liquid into a rocks glass with ice. The recipe calls for a watermelon slice to garnish, and I added a sprig of basil because I thought the basil flavor wasn't coming through in the drink. The In-Sandiary called for a similar process, but using a glass rimmed with a mix of salt, sugar, and ancho chile powder. For the Kentucky Devil I had to shake the watermelon chunks with the bourbon, sugar, lemon juice, and adobo sauce without muddling it first, which didn't seem to yield much juice. Although the cocktails sounded similar on paper—they all involved watermelon, some kind of chile, lemon or lime juice, and sugar—they tasted very different. The base spirit contributed to that, of course, but the proportions of ingredients also varied quite a bit. The Kentucky Devil was a much heavier drink than the other two, thanks to the bourbon, the thick adobo sauce, and the fact that it had less watermelon juice. It might be better as a cool-weather drink but it was weirdly viscous. The In-Sandiary, on the other hand, tasted almost watery, probably because it had more watermelon in it and therefore more juice. The chile-salt-sugar rim helped add flavor, but whenever I took a sip without getting some of the spice mix, the drink fell flat. The Red Lady, however, was phenomenal. The fruitiness of the watermelon, the smokiness and spice of the chile syrup, the citrusy acidity of the lemon, and the subtle sweetness of the pisco combined to create a beautifully balanced cocktail. It was sweet but not syrupy, and between the watermelon and the basil, it smelled like summer. I suspect I would have liked the first two cocktails a lot better if I hadn't been comparing them to the Red Lady; after tasting it, my friend summed it up by commenting, "I feel really bad for the other two." Muddle watermelon and basil in a shaker. Add pisco, chile syrup, lemon juice, and ice. 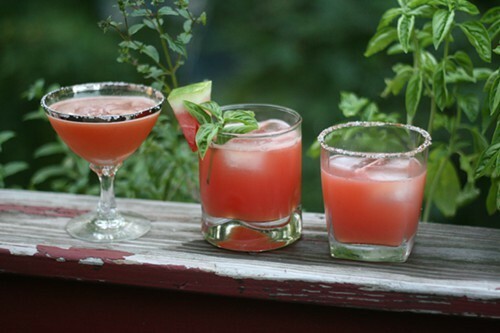 Shake vigorously and strain into a rocks glass filled with ice; garnish with watermelon slice and sprig of basil. Combine all ingredients in a saucepan; heat until sugar is dissolved, and let stand for at least 30 minutes before straining out the crushed chiles. Julia Thiel writes about booze on Thursdays. Cantaloupe cocktails: To foam or not to foam? Aggressive foam makes for a trying time drinking cantaloupe cocktails. Lemon or lime? Powdered sugar or simple syrup? For such a simple cocktail, the pisco sour has endless variations.